ItemBARK_1980.0001.0010 - Unidentified Chinese woman, Courtney; February 20, 1933. Item BARK_1980.0001.0010 - Unidentified Chinese woman, Courtney; February 20, 1933. 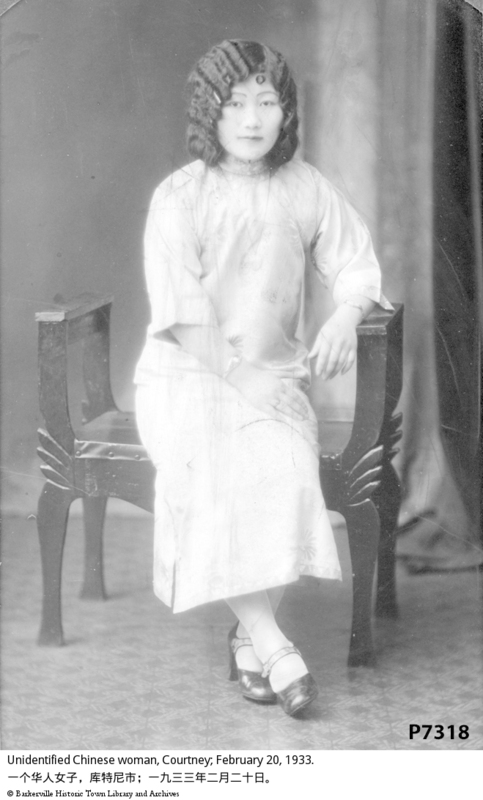 A portrait photograph of a young, beautiful Chinese woman in a sitting pose on a backless wooden chair. She is wearing a mid-calf length, high-necked gown with elbow length sleeves. The photograph is mounted in a cream and black display type case with a curved top triangular flaps at the back to support the photograph in an upright position. Caption on the back of the frame: Dear Sister Ida, Your Sincereley Sister Lillian. Taking on Feb 20, 1933. Front of the frame has a logo, presumably from photography studio: N Swartze, Courtenay BC. Woman identified as Mrs. Lee Chong's sister Lillian.